Why buy cheap furniture? Why shop at Ikea? Why not unwrap your purchases? Why ask? 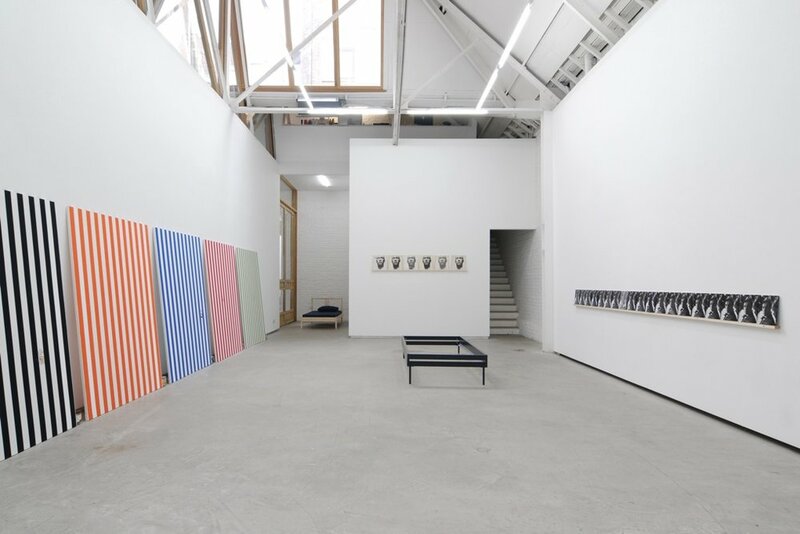 Gently satirical takes on Daniel Buren’s Peinture acrylique blanche sur tissu rayé blanc et coloré the main space. 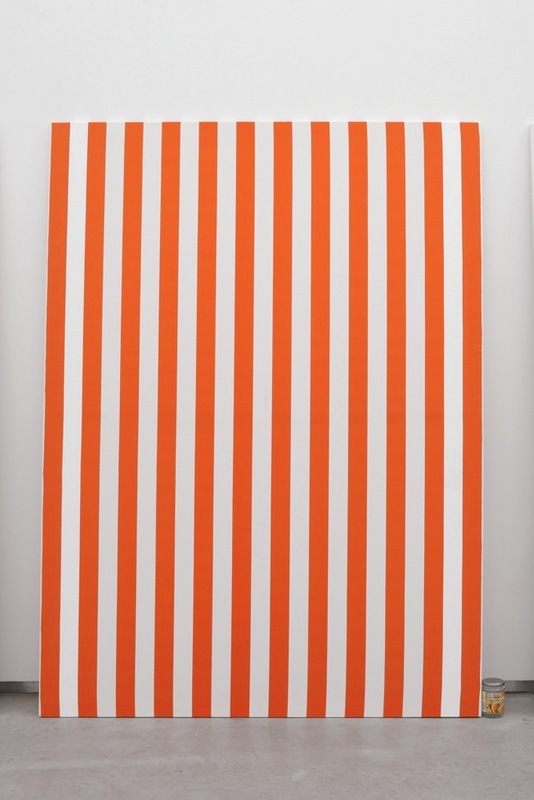 The striped canvases reference a piece owned by a collector from Brussels in the 70s that became (un)fortunately stained after acquisition. Perhaps if the work hadn’t been restored to it’s former state it’s rarity and thus market value would have increased. Jacques André revives the stained canvas five times representing Ikea’s colour spectrum and equally encompassing grip on it’s market. Signaling new directions in Jacques André’s practice KONSMO references both the Ikea product range that is taken here as medium and a play on the words ‘con’ and ‘consume’. 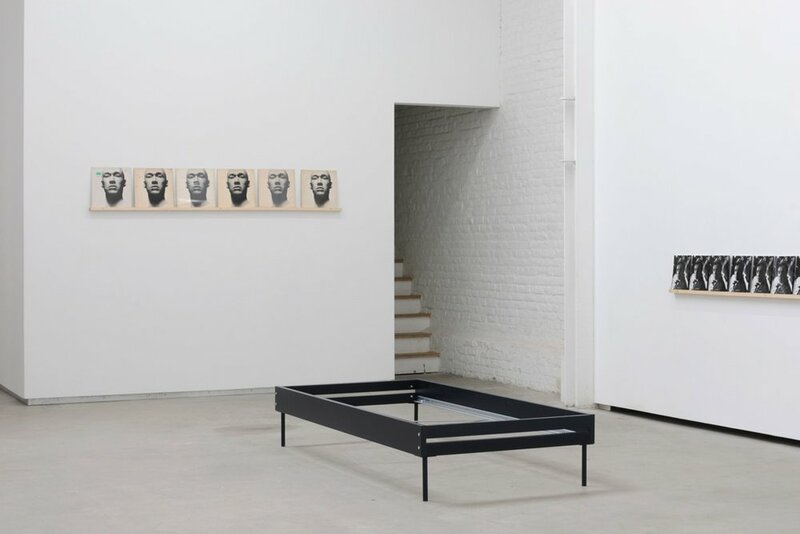 Exhibited works are a continuation of Jacques André’s practice addressing the hypocritical nature of the supposedly liberated consumer. Jacques André’s parallel status as unemployed has long countered his artistic career. 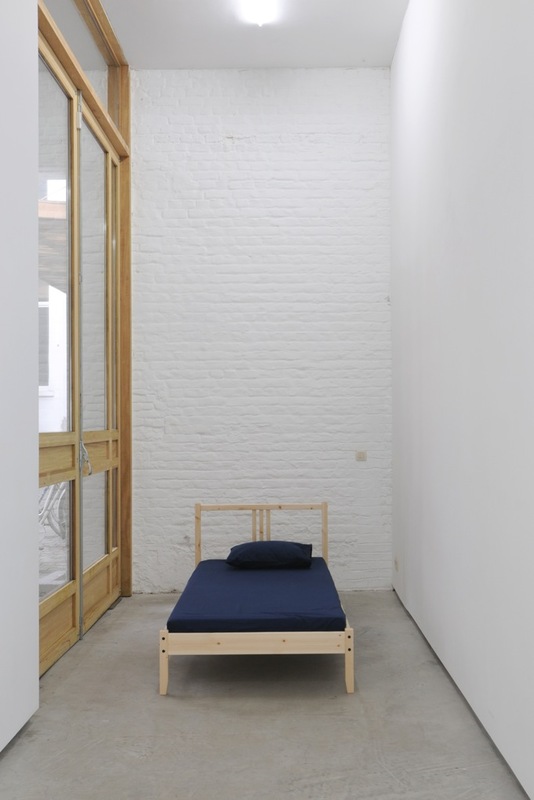 KONSMO coincides with Jacques André’s 20th year out of work and the end of his entitlement to unemployment benefit. Marking the occasion a Librairie of repetitive purchases of books (unavailable for purchase) are on display. The opening of this bookshop simultaneously fulfills and confounds a career pathway much encouraged by Jacques André’s dole officers. 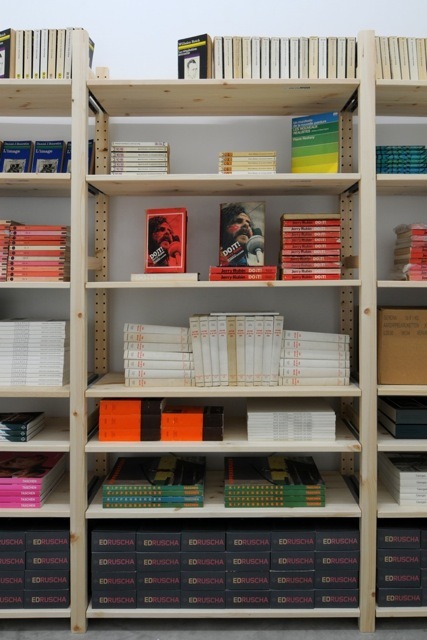 The unconsummated ‘exhausted’ bookshop signals the exhaustion of the freely circulated stock of items Jacques André buys and is a shift in his appropriated production methods. 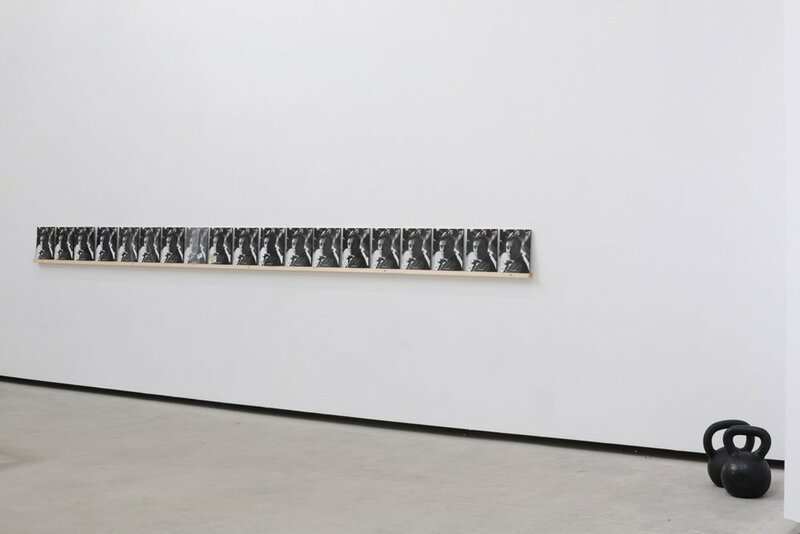 Six examples of Kung Fu records hang at the accurate height of the actor Carradine pictured on the sleeve whilst 19 Yves Klein’s observe the Nicole striped canvases from the perspective of a 5 year old child. 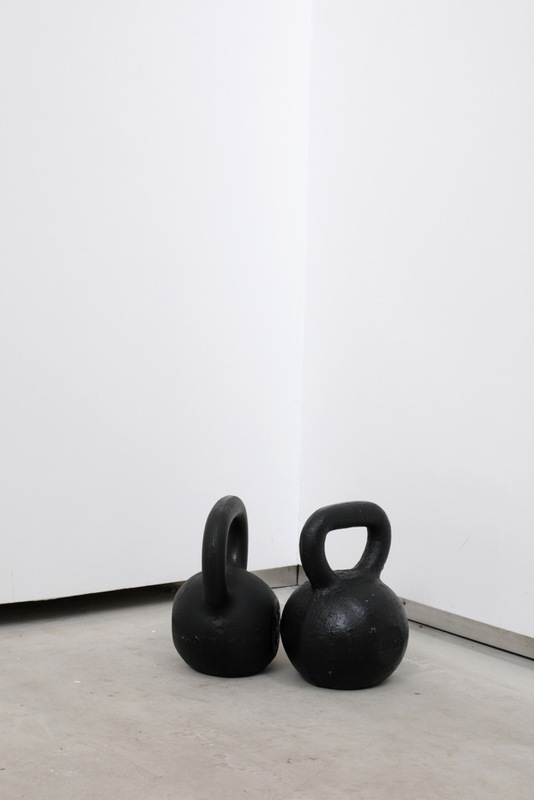 Jacques André’s own body weight adds literal weight to the exhibition and is available as two kettlebells should a collector wish to carry him out of the show. In KONSMO the concept of circulation is at the fore; that of major and minor markets, globalised and niche industry, consumption abstracted and turned on itself, a defunct yet tantalisingly latent economy, exhausted.